Flex. Now watch me work. Our roundup of the furniture design trends we saw at NeoCon 2016. The South Lobby at the Mart — kitted out by Herman Miller — braces for the over 53,000 attendees (up six percent from last year) who descended upon Chicago for NeoCon 2016. Photo by Fran Parente, courtesy of Herman Miller. Click the image for more details. The excerpt above comprises lyrics from a not entirely safe for work song, and it was stuck in my head all week last week in Chicago (where – one hopes – everything we saw was, on the contrary, quite SFW). Because if the latest in contract furnishing is any indication, that’s pretty much all we’re going to be doing for the foreseeable future: Flexing. And watching people work. Even with what seemed to be this year’s popular concessions to privacy across increasingly open floor plates — high-backed booths that look suspiciously like, well, restaurant booths, and mobile furniture (marker boards, carts, perches) that you can move around on casters to create “space within a space” — there’s no denying that almost all of the new products we saw have been designed to support work in an open space, and what’s more: impermanently so. So whether you’re creating space for a startup with a short term lease, or for a big corporation experimenting with a more flexible environment (inspired by coworking, perhaps? ), you’ve got a variety of new items to choose from that will roll — quite literally — with you. And if there was one constant across the board, it’s this: manufacturers are responding to the fact that work today is everything but a — apologies to Rae Sremmard — no flex zone. Couldn’t resist. Scroll for five other big takeaways about the furniture design trends we spotted (and only one more song). The buzz (and the long, annual lines for the elevators). Photo by Wittefini Photography, courtesy of Novità Communications. Much of this is thought to be inspired by coworking — or at least the industry’s (and their clients’) impression of it. IdeaPaint’s Pivot, designed with Primo Orpilla and Uhuru Design. Photo by Jasper Sanidad. IdeaPaint’s Hive, designed with Primo Orpilla and Uhuru Design. Photo by Jasper Sanidad. In any case, we’ve reached peak open office, and another benefit of the ability of a marker board or a similar apparatus to moonlight as a mobile wall is that it confers the illusion of privacy on users (which, despite what people say, may be all we need to soothe our uneasiness about working in an open space). The first floor IdeaPaint installation at NeoCon 2016, where the company partnered with designer Primo Orpilla of O+A and the master crafters at Uhuru Design to introduce three mobile new dry erase products. In the foreground is Pivot, a mobile whiteboard that converts to a bar height table with the press of a button. Behind it stands Hive, a new mobile dry erase board. And in the very back you see the Mobile ThinkTank, an ultralight camper, the interior of which is completely coated in dry erase paint. These three products represent IdeaPaint’s first foray into product design since the launch of their premium dry erase paint in 2008. Photo by Jasper Sanidad, courtesy of IdeaPaint. Knoll turned heads, too, with their own big launch of Rockwell Unscripted, a furniture collection designed in collaboration with David Rockwell of Rockwell Group. And in the same vein as IdeaPaint’s mobile dry erase offerings, Unscripted’s slew of new steps, tables, and soft seating are complemented by a host of “borders” and mobile storage elements. 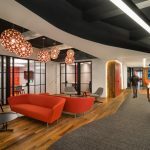 The borders, according to Knoll, add visual and acoustic privacy, and also “define open-ended spaces, create a sense of discovery, and provide a richness of experience in a workplace that can transform in the moment and evolve over time”. The mobile storage elements serve “as an activator in the space, putting inspiration within reach by equipping workspaces with easy-access, object-based storage”. At top, Rockwell Unscripted’s border elements, from left to right, the Creative Wall, and the Puffy and Telly screens. Like IdeaPaint’s mobile dry erase boards, these can be easily moved and arranged in open areas to create space within a space. Below, Unscripted’s storage elements, including modular storage, credenzas and consoles, lockers, hospitality carts, and mobile storage carts. Images courtesy of Knoll. The desired result is a more flexible work environment “that enables a variety of experiences and empowers users to transform their space at a moment’s notice, evolving it with use.” And here we’d be remiss not to give a shout out to Knoll’s latest white paper, “Immersive Planning”. In there, they describe five significant factors driving workplace thinking, all of which are addressed in one way or another by the Unscripted collection. And for more on Rockwell Unscripted, check out our pre-NeoCon (PreoCon?) product profile. Teknion’s new Zones collection, designed with PearsonLloyd. Image courtesy of Teknion. Click through for more details. One of Teknion’s semi-private hubs, a piece in their new Zones collection. Image courtesy of Teknion. Click through the image for more details. Then again, we were hungry. Finally — for this first section, anyway — we take you to West Elm Workspace, where we saw more mobile marker boards, more mobile screen systems, and more high-backed booths (that’s not to say we’re bored!). West Elm debuted their first-ever Workspace collection last year at NeoCon, and while the products looked good — we thought it supercool that the home furnishings darling was tackling the office in earnest — we yearned to see more substance behind the stylish settings. West Elm, we wanted you to be pretty and smart! Enter our friends at PLASTARC, a social research and design consultancy firm founded by Melissa Marsh. Supported by PLASTARC research, West Elm added 55 new products to their core collection this year, all designed to bring more — say it with us now — choice and flexibility into the work environment. The range of solutions includes modular seating options that allow users to configure them in ways to support group settings or as areas for private concentration, as well as a system of flexible screen panels that can be used to carve out that ever-desirable “space within a space”. West Elm Workspace’s new mid-century inspired Arc Screen System comes in varying heights and widths to suit all sorts of different tasks. Photo by Wittefini Photography, courtesy of Novità Communications. Click through the image for more details. Not to keep talking about food, but when I was little, I used to love to dig my mom’s dining room table pads out of storage and build forts in the living room. Is that not what you think of when you see that image, above, of their Arc Screen System? It’s like this very primal, childlike thing — to build forts in open spaces. Welcome to the workplace of the future! All of the images we’ve already shown you have one thing in common. Can you spot it? Every last one of them features a product hewn of oak or beech or something similar. And that wasn’t even our section on the topic! This is! Brace yourselves for some lumber. Nobody picks out a white laminate table for their home. So why until now have we expected them to want it for the office? Here’s “flexibility” and “mobility” from a really close angle: swivel seats were a thing this year. Reps described it across the board as valuable because hey, look, you can be sitting here focusing on your work or an informal meeting, turn to the side for a chat with a person who walks behind you, then twist and turn right back to the task at hand. The swivel may have smacked as too cute (I hope no one’s offended? I am the one embedding the Snow White soundtrack here), but Teknion Textiles’ rebranding as Luum, and an inspired story behind one of KnollTextiles latest offerings has me sold. A peek at Suzanne Tick’s process wall for Luum’s inaugural collection, Starting Point. Photo by Wittefini Photography, courtesy of Novità Communications. Click the image for more details. To drive home the point, the front window of the new Luum showroom was emblazoned with the words “It all starts with our hands”. Upholstery patterns from the Odyssey Collection with the heirloom rug that inspired it in the background. Image courtesy of KnollTextiles; click through for more details. Vegetation overtook the Mart this year, something we fully support for the way it promotes positive biophilic responses and just because it looks so, I don’t know, agreeable? (That impression is probably a biophilic response in itself.) If you don’t spec one product you saw at NeoCon this year but you’ve been inspired to put a plant on your previously barren desk, we’d deem your trip a success. A vignette in the Herman Miller showroom at NeoCon 2016. Photo by Fran Parente, courtesy of Herman Miller. Nobody does flora (and, actually, fauna) better than Herman Miller. This year they fully embraced, in their words, a “garden haven” vibe. Their installation in the Mart’s expansive South Lobby made the biggest impression, a place for tired NeoConners to recharge — electronically, physically, and emotionally — with an array of lounge seating, Ode lamps, and spots to plug in. Attendees recharge in the South Lobby. Photo by Wittefini Photography, courtesy of Novità Communications. 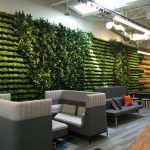 Props to Herman Miller, too, for getting really creative with the greenery: I didn’t spot one fiddle-leaf fig in their showroom or the lobby. For the uninitiated, the fiddle-leaf is, according to the New York Times, “the ‘it’ plant of the design world.” Also for the uninitiated, if the Times is covering a trend, it’s considered by many to mean that the trend has long since reached its saturation point. In other words: let’s mix things up, people! Because elsewhere, there were fiddles. Lots of fiddles. The only one who gets a pass is Knoll, because apparently the now ubiquitous ficus was, at least back in the day, Florence Knoll‘s favorite. Florence Knoll: OG fiddle-leaf. The ultimate trendsetter! At top, a contact sheet for a vintage Knoll advertisement, edited by Florence Knoll (if anyone knows the exact year, do tell!). The “plant here” note and sketch in the upper left look suspiciously like suggestions for a fiddle-leaf fig. Image from the Knoll Archive, via Knoll.com. At bottom, a snap of Knoll’s showroom at NeoCon 2016, with a forest of their new HiLo perches in the foreground and the real thing off the the right. Image via Knoll.com. Click each image for more details. The new Fern desk chair, created by Haworth Design Studio and ITO Design. Image via haworth.com. Click on it for more details. Also cool: The paper fern installation in the Haworth showroom that Patricia Urquiola created to celebrate the launch of Fern. Thank you to everyone who helped to make NeoCon 2016 a fun one, especially the team at Novità Communications and each and every showroom host for the gracious receptions and excellent tours. See you next year! This could also been called the Hipster NeoCon. A lot of these products seemed aimed at start-up companies, or perhaps more accurately, companies that want to look like their idea of cool start-ups. The civil war surgeons in their vintage bowling shirts were in attendance. One such vendor had a very nicely detailed benching product, but when I asked if it was height adjustable the answer was, “no, we’re doing analog”. Uh huh. Sedentary work be damned or other kinds of physical risk for that matter. In the course of 1 minute I saw no less than 2 people bang their heads in the McDonald’s inspired jungle gym. As noted, many other vendors want to challenge the idea that the office workplace is safer than the assembly line. It’s all well and good in a playground where the bodies are small, light and resilient, but it’s hard to see a multi-generational workforce embracing this the way some major vendors seem to be hoping. Still, I have a bunch of photos now to scare my environment, health and safety people with.